Fawkner singer-songwriter Jasmine Rae has hit back at a not so-subtle foreign invaders in the title track of her fourth album Heartbea t.
No, not the terrorists and drive-by shooters cutting a swathe through the mean streets of our suburbs and cities. “This song is about breaking through the noise”, Jasmine, now 27, revealed of the song that was accompanied by a video clip played on Nu Country TV on May 9. “We're bombarded now with self-help books and TV ads for gym equipment that will change our life. Well-meaning people who are more than happy to tell you how to be a better person. How to be more like them. I sometimes find that I lose the balance between listening to advice and listening to my own thoughts and that puts me on the road to doubt myself. But there's always going to be one person who disagrees, because we're all different and that's a good thing. “I sometimes find I lose the balance between listening to advice and listening to my own thoughts, and that puts me on the road to doubt myself. But there's always going to be one person who disagrees, because we're all different and that's a good thing. The clip was filmed by award-winning video producer-film-maker Robb Cox. It featured Jasmine cooking up a storm in her chaos cluttered kitchen as both a performer and actress. Rae chose Grammy-winning Nashville producer Luke Wooten whose other clients include Nashville artists Brad Paisley, Dierks Bentley, and Kellie Pickler and Van Diemen's Land exports The Wolfe Brothers . It followed 2013 release If I Want To that was nominated for an ARIA Award and four Golden Guitars. Her three singles included Bad Boys Get Me Good featuring Pickler. Fellow Victorian raised singing restaurateur Adam Brand joined Jasmine on their duet Quit This Time - also on Brand's 12th album My Side Of The Street. The duo - finalists in six G olden Guitars sections at in Tamworth in January - performed a live version on Nu Country TV on December 4. Thrice wed Brand, now 45 and born in Perth , spent much of his adolescence in Rae's home state, and operates Brandy's restaurants in Townsville and Coffs Harbour as culinary passions. Adam, raised in strawberry fields of Wallington near Geelong and dairy belt town Colac in Western Victoria by his mother and pastor stepfather, returned to Perth in his teens before selling his signwriting business and heading east in 1997 in his XF Ute. Brand stayed in Sydney during his career launch, moved to Nerang on the Gold Coast near his three sisters and family, shifted north to Hervey Bay and had a two year stint in Nashville . So far Jasmine has confined her Nashville invasions to recording, song-writing and live performance showcases. 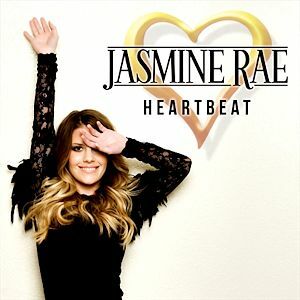 “I'm very happy to see where this album takes me,” says Rae who wrote 10 of the 12 songs on Heartbeat . “I love coming home but I'm also open to adventure. I've had a lot of opportunities in the States, including recording with Joe Nichols and Kellie Pickler, and working with Luke Wooten who really understands my music. So whatever happens in the future I'll embrace it with open arms. “Today I held flowers, and dressed in white/ I made a promise, my mother cried/ and every moment till this one right now/ fades in the shadow/ of the love that we've found.” - When I Found You - Jasmine Rae. Rae used song-writing as therapy on her previous album If I Want To after the death of her dad - a panel beating and motor industry business owner - at 56 from bowel cancer. She wrote First Song with fellow Victorian Briana Lee and Just Don't Ask me How I Am with Nashville hit writer George Teren. This time Losing You All Over Again reflected the collective grief of Jasmine and her widow mother who were his carers during his cancer battle. “Ultimately it helped me to establish a more fearless and defined musical vision,” Rae revealed. Losing You All Over Again expanded on that grief. But the singer wrote When I Found You for a happier occasion - a friend's wedding. “You know how you have that one friend that you've been friends with for as long as you can remember?” Rae explained. Rae also exhibited a little humour when she wrote entrée song Everybody Wants To Take My Money. “It was inspired by my bank balance,” she joked. She also revamped Brandy Clark-Mark Stephen Jones tune Hold My Hand that Brandy performed live on the Grammys with Kentucky born singing actor Dwight Yoakam. “But my version is really different from the original,” Rae explained. Equally down home is her animal farm bluegrass-laced stomper Eggs In A Basket with its humorous homilies. “When's this love gonna die/ when are you gonna let go/ why is it so hard to say/ what we already know/ boy, I can't get a pulse/ all I get is a flat line/ don't think we're gonna bring it back to life this time.” - Zombie Love - Jasmine Rae-Phil Barton. Rae wrote Zombie Love - a tale about recidivist love with an uncontrollable boomerang - with fellow Australian tunesmith Phil Barton. “I have a habit of letting something really be over before I call it quits,” Rae confessed. “I don't like to waste things that are really good so I guess that's why I wait until something's clearly rotting before I get rid of it. Rae also explores ruptured romance in This Is Whom I Am In Love and Don't I Wish It Was. “It was meant to be a traditional country ballad but it ended up having a much more soulful, bluesy feel,” Rae says of the latter song. The album finale Fly Away was a nocturnal jaw locking creation from Orpheus. Rae is a dynamic live performer - a skill she translates to her acting roles in videos. So will she pursue the acting quotient? “I would like to do that,” Rae says. Rae has opened for several major international artists including Georgian superstar Alan Jackson. “Yeah, there was a few people who were put to him by his label or whoever does that over there,” Rae confessed of his request for her to be his support act on his Australian tour in March, 2011. And Arkansas born Joe Nichols, with whom Jasmine performed at The Forum in the CBD of her hometown in May, 2011, and recorded I'll Try Anything ? “I didn't actually write that song,” Rae confessed.